When Tessa comes home from her weekly cemetery visit she finds a little boy, Harry, in her kitchen. Harry asks her if Tessa is his mother, but Tessa has never seen him. She lost both of her children and she and her husband Scott are separated so she's all alone. Tessa calls Scott, because she has nobody else she can turn to, and together they wait for the police to arrive. Unfortunately instead of finding out how Harry ended up in her house Tessa is being treated as a suspect. Soon the boy in Tessa's kitchen is national news. Tessa's life turns into a big mess when journalists are following her everywhere. She's being accused of abduction and everyone seems to be against her, even Scott. Is there anybody on her side, who can Tessa trust? Because she isn't getting any answers, Tessa has to see if she can find information herself. Will she succeed and will she be able to clear her name? Who is Harry and what was he doing in Tessa's kitchen? The Secret Mother is a gripping story. Tessa has been through a lot. She's devastated because of the loss of both of her children at different moments and is grieving. Work is what's keeping her sane. However, nobody believes she's just sad and nothing else. My heart ached for the distrust and injustice she has to deal with. Tessa never gives up though. She's a strong woman and her determination to find answers is admirable. I loved how she keeps fighting until the very end, she doesn't stop before she knows the truth. I couldn't turn the pages quickly enough to find out more about Harry and read The Secret Mother in one sitting. Shalini Boland has a great suspenseful writing style. She knows how to describe deep and dark emotions and combines them with an intriguing mystery. The Secret Mother is filled with suspense and despair. I liked how well Tessa's character comes to life, it was practically possible to feel what she feels and see what she sees. I love it when I can get so close to a main character. I was both moved and captivated by her story. I enjoy reading books about secrets and really liked this one. The Secret Mother is a terrific story with a fabulous fitting ending. 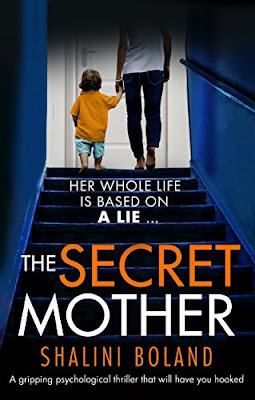 The Secret Mother would be an excellent choice for readers who love gripping emotional stories. What I love about suspance novels is that you think you know how things are going to turn out and then BOOM! Plot twist! This novel seems mysterious and engaging, you reviewed it very very! Intriguing and full of suspence. Sounds like a great book. It sounds like a real page turner ! Awesome! Yes! I already crave it. Thank you for pointing it out. Wow! Mystery, suspense, raw emotion; it's got it all! Oh I feel so bad for Tessa & I really want to know why Harry showed up at her house. This sounds like a truly horrific situation to be in as a mother. Loved the book immensely! This was a reading that kept me intrigued and I finished half of it in one setting. I am a pretty good reader but had gotten lazy over the last few years but this was interesting and kept me engaged.